China’s recent implementation of “one-year import suspension of ivory carvings” and the very limited amount of ivory import that will be affected, underlines how small the legal ivory trade really is in China. Though negligible, the legal ivory trade is the ultimate culprit in attracting, incentivising and disguising a massive illegal ivory trade. In order to understand the situation, we need to go back to 1989 when CITES banned the international trade in elephant ivory. The ivory trade ban provided elephants—a long living and slow breeding species—some much-needed reprieve. African elephant populations started to recover from the devastating massacres in the 1970s and 80s that more than halved their population. However, the trade ban was short-lived, undermined by a series of legal ivory sales, including one in 2008, when China bought 62 tonnes of ivory, which is being distributing at an annual rate of 5 tonnnes to the 37 government-approved ivory carving factories. These legal sales have removed any stigma attached to ivory consumption created by the initial trade ban, confused consumers and reinvigorated demand for ivory. In China, elephant ivory and rhino horn were promoted aggressively to by traders and investors for their so-called “inflation-proof investment value.” With its price sky-rocketing, ivory was considered “white gold” by people seeking to demonstrate their wealth and status. CITES identified China as the single most important influence on the increasing trend in illegal trade in ivory since 1995. Market investigations found widespread abuse of the ivory trade control system which provides cover for a flourishing illegal ivory trade. One owner of a factory that carves ivory admitted that the government rationed legal ivory only one month of a year, making 91%of the ivory coming through the factory from illegal sources. Under the disguise of a government-approved license a convicted ivory smuggler trafficked 7.7 tonnes of ivory from Africa to China in 2011. NGO investigations found that ivory from the CITES-approved legal ivory sale was bought for an average price of US$157 per kilo, yet sold to licensed ivory carving factories for as much as US$1,500 per kilo. The huge mark-up in price for the legal ivory forced many licensed ivory carving factory owners to source the much cheaper illegal ivory in order to make up the profit. The grey markets created by the legal ivory trade not only play into the hands of criminals smuggling ivory and poaching elephants, but also fuels official corruption. An official convicted of corruption was found to have received bribes in the form of ivory tusks. Allegations of government officials using diplomatic channels to smuggle ivory have repeatedly surfaced in the media. It has been a well-known “secret” that the arrival of Chinese delegations in Africa could even jack up market price for ivory. Escalating demand and rising ivory prices in China incentivises poaching of elephants. A recent study documented an estimated 100,000 elephants were killed for their ivory across Africa from 2010-2012. Scientists warn if the demand for ivory is not reduced, some elephant populations in Africa could become extinct in ten years. To counter escalating demand, NGOs campaign to dissuade ivory consumption. IFAW’s ad campaign “Mom, I have teeth” reduced the propensity of Chinese to purchase ivory by half. Awareness raising campaigns can erase ignorance but cannot eradicate greed. Enlightened Chinese public increasingly support a full ivory trade ban as means to save elephants and combat corruption. At the annual legislative and political advisory sessions earlier thos month in Beijing, delegates tabled proposals for a crackdown on official consumption of endangered species. Surveys have found that the most compelling reason given by former ivory buyers for not consuming ivory in the future would be for the government to make the buying of ivory buying illegal in all circumstances. 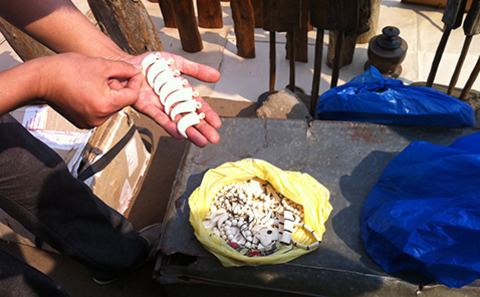 Illegal ivory trade has long eclipsed the legal one in China. Banning ivory trade will only hurt the criminals banking on the extinction of elephants, who have long enjoyed the high-profit and low-risk nature of the illegal ivory trade. Grace Gabriel is Asia Regional Director of the International Fund for Animal Welfare (IFAW).